Posted on April 21, 2015 by Hawaii's Local Buzz. This Mother’s Day, show your mom you really care with some delicious treats from Hawaii’s Local Buzz. From chocolate treats to shortbread cookies, all of our decadent creations are made with naturally grown ingredients from our family farms. One of our star creations, chocolate covered coffee bean crunch is perfect for Mother’s Day. It’s made from the finest Hawaiian Ka’u coffee beans, which are enveloped in rich Guittard chocolate. The dark chocolate vanilla flavor includes hints of organic raw sugar and vanilla infused sea salt for an impeccably balanced flavor, and the white chocolate cinnamon bun is every white chocolate lover’s dream. Handcrafted in small batches, our tropical shortbread cookies are delicate and buttery-rich. 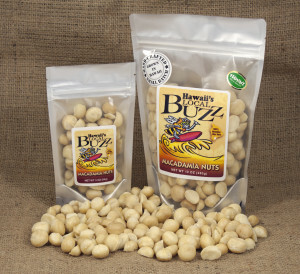 We add bits of our famous dehydrated macadamia nuts to every batch, along with tropical dried fruits. Choose from mango mac, pineapple mac, coconut mac, and pineapple coconut mac varieties. Our dehydrated macadamia nuts come in many flavors, from natural sea salt to caramel crunch. The sweet flavors would make the perfect Mother’s Day treat for a mom who loves to snack on healthier treats. The caramel crunch nuts are infused with real vanilla and hints of sea salt, and the cinnamon bun variety is flavored with brown sugar, real vanilla extract, and vanilla infused sea salt. If you’re not sure which flavor your mom would prefer, order her a few 5-ounce bags of various flavors. Hawaii’s Local Buzz offers everything you need for a great Mother’s Day. While you’re ordering your mom some sweet treats, don’t forget to also order some of our delicacies to try for yourself. All of our coffees, honeys, and treats come in various sizes, allowing you to order small quantities and sample everything you crave.